A bit more overworked than I would have liked, but I guess the next one will be have a lighter touch. Tanja, thanks so much for stopping by my blog - I love your work and signed on to follow you. 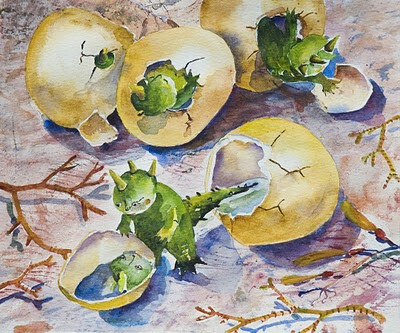 I really like in this piece how all the dinos are in different stages of emerging - especially the one looking at his reflection! Hi Tanja. Thanks for the lovely comment on my blog. Your work is beautiful - such a light touch and great colours. I like your use of watercolor. I get a really sense of space and the shapes really fit will in there surrounding.